The American Academy of Pediatrics finds the best toys for children’s development are those that foster play between a caregiver and child. As digital media-based gadgets increasingly fill the children’s toy aisles, the American Academy of Pediatrics warns families against using them as a replacement to the traditional hands-on toys and games that fuel the imagination and aid in healthy development. The AAP offers families and physicians guidance in an updated clinical report, “Selecting Appropriate Toys for Young Children in the Digital Era.” The report focuses on toys for children from birth through school age. Ideal toys are those that match children’s developmental abilities, while encouraging the growth of new skills, according to the AAP. Toys are key to developing children’s brains, language interactions, symbolic and pretend play, problem-solving, social interactions and physical activity – and are increasingly important as children move from infancy into toddlerhood. 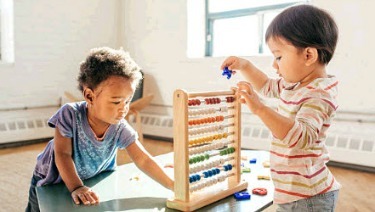 Electronic toys by themselves do not provide children with the interaction and parental engagement that is critical to healthy development, according to the report. Many of the new “interactive” media -including videos, computer programs and specialized books with voice-recorded reading --make claims about educational benefits in advertisements that are unsubstantiated, according to AAP. The clinical report also covers safety considerations when choosing toys, and the appropriateness of toys for children with special needs. The AAP provides suggestions for how pediatricians can incorporate toys in the office setting. Understand the most educational toy is one that fosters interactions between caregivers and children in supportive, unconditional play. Choose toys that are not overstimulating and encourage children to use their imaginations. Use children’s books to develop ideas for pretending together while playing with toys. Limit video game and computer game use by young children. Total screen time, including television and computer use, should be less than 1 hour per day for children 2 years or older, and avoided in those younger than 18-24 months. Children younger than 5 years should play with computer or video games only if they are developmentally appropriate, and they should be accompanied by the parent or caregiver. “The more we know about early brain development, the more we understand the need for play that is based on human interaction,” Dr. Healey said. “There is no screen, video game or app that can replace the relationships built over toys."